Two months before the release of the Nelson Mandela biopic, his ex-wife draws first cinematic blood. Her perspective on Nelson’s struggle is vividly told in the upcoming film, Winnie Mandela. 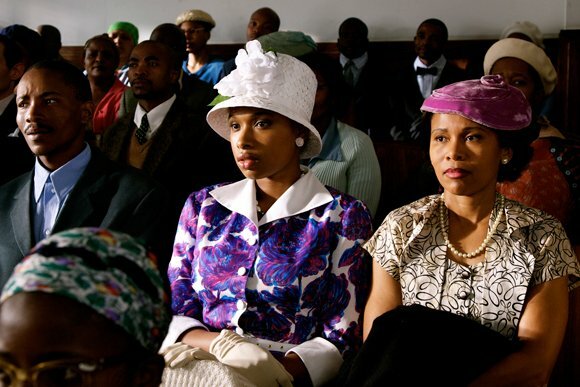 The film, starring Jennifer Hudson and Terrence Howard, is an adaptation of Anné Mariè du Preez Bezdrob’s biography Winnie Mandela: A Life, the film explores the personal and political life of the wife of renowned activist and revered former South African President, Nelson Mandela, telling the story of her struggle for the freedom during the Apartheid era. The casting of Hudson caused much consternation, especially in light of the lack of communication and input from the real Winnie Mandela and to a lesser degree, Howard. In this clip below, the Oscar-winning actress channels Winnie while under detention in solitary confinement. Winnie described this period as the darkest of her life during the apartheid regime. Her harrowing isolated confinement lasted for over a year after security police detained her at her Soweto home on May 12, 1969. She was held at Pretoria Central Prison with a group of other fighters under the notorious Terrorism Act. Her then-husband Nelson Mandela had already been in prison almost seven years by then. Mandela: The Long Walk to Freedom stars Idris Elba as Nelson Mandela and Naomie Harris as Winnie Mandela in the upcoming film. Winnie Mandela opens nationwide on September 6th.